This species is declining throughout its widespread range and has become increasingly rare, although several dozen occurrences remain; many of them with good viability. Distribution is greatly fragmented but remains relatively wide. Long-term viability of most populations is questionable especially those in large rivers where zebra mussel populations are now established. It was historically widespread in the upper Mississippi and Ohio River drainages. It was widespread but never abundant in the Tennessee River system. It has been drastically reduced in range and is endangered in many states where it occurs. Extant populations can still be found in Wisconsin, Illinois, Indiana, Kentucky, Michigan, Ohio, Pennsylvania, Tennessee, and West Virginia. Most populations are small and geographically isolated from one another. In Mississippi, it is found only in Tennessee River drainage. In Arkansas, it is known from a handfull of sites represented by only single or a few specimens in each. It was historically known from New York in the Niagara River, Lake, Erie, and the Buffalo River but is likely extirpated there (although two spent shells were recently found in the Niagara River drainage). Comments: The snuffbox is within a very environmentally sensitive group of mussels. Several Epioblasma species have gone extinct and numerous others are federally endangered east of Kansas. 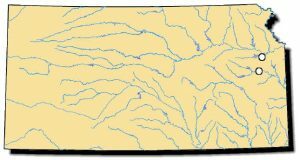 This sensitivity holds true for the snuffbox as well because it has not been found within Kansas since the early 1900s, when degraded water quality began to affect aquatic life. Relic shells have been documented in the Wakarusa and Marais des Cygnes rivers. 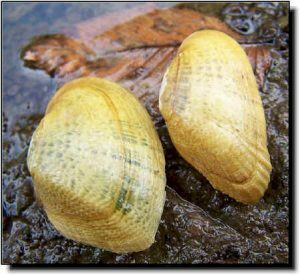 In neighboring states, this mussel inhabits riffles and runs with swift current and sandy gravel or gravel/cobble substrates in nearly pristine environments. This shell can be differentiated as having a prominent posterior ridge and small corrugations leading to the margin. Males are oval in shape and flattened while the females are elongated and pointed at the posterior end. The snuffbox female uses a lure to attract the logperch (its only known fish host). While attempting to eat the lure, the logperch’s nose is trapped by the mussel as the shell clamps shut. The host fish is held for a short period of time while the snuffbox female billows her glochidia into the fish’s mouth. This strategy greatly improves the chances the glochidia come in contact with the logperch’s gills. After this encounter, the host fish is released. Other species of fish have been known to die from this bizarre encounter.